This article originally appeared in the Culture section of Bloomberg News on June 9, 2008. June 9 (Bloomberg) — Alexei Ratmansky’s “Concerto DSCH,” by far the most exciting new ballet I’ve seen in ages, had its world premiere last week in the New York City Ballet’s spring season at Lincoln Center. At first it looks like a mere romp — Jazz Age youth cavorting on the beach — but almost immediately its unflaggingly deft and original construction becomes apparent. Taking its title from its score, Dimitri Shostakovich’s Second Piano Concerto, the ballet sets in motion a clear cast of characters, without getting bogged down in introducing them formally. Ratmansky arranges the action so ingeniously that the viewer can identify them even as the dance hurtles on. Wendy Whelan (a cool mermaid) and Benjamin Millepied (her hopelessly ardent swain) provide fleeting summer romance; virtuosi Ashley Bouder, Joaquin De Luz and Gonzalo Garcia are like rough-and-tumble saltimbanques on speed. The 14-member ensemble, creating whirlwinds as a whole, also fractures into smaller units to serve as demi-soloists. The marvel of the choreography is that the groupings keep combining and recombining, often very unusually placed on the stage. Ratmansky’s virtues don’t stop here. His choreography concerns itself with people, not just dancers and their phenomenal physicality. Earlier this year, Ratmansky said he planned to resign as artistic director of the Bolshoi Ballet in order to devote himself to choreography. His work, accomplished and fresh, is much in demand from world-class companies. City Ballet was considering him as a replacement for company choreographer Christopher Wheeldon, but the arrangement fell through. “Concerto DSCH” suggests it’s time for the proposition to be reconsidered. 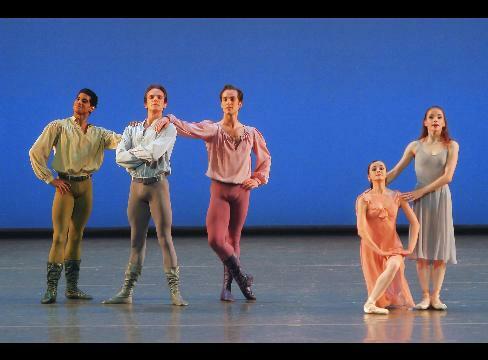 Meanwhile City Ballet continues its season-long celebration of Jerome Robbins. So far, the incontestable highlight has been “Definitive Chopin,” a program offering three ballets with music by the composer to whom Robbins repeatedly returned. The main entry is the 1969 “Dances at a Gathering,” in which the young people of a rural community bond with one another and with the land that is their home. Contentment, a teasing gaiety, emotionally stormy weather tempered by reconciliation, the qualified acceptance of a newcomer among them — all are tinged with unclouded optimism, undercut by just one tableau that hints at the approaching destruction of war. The present production is the most technically polished and musically sensitive I’ve seen since the premiere, which was buoyed by charismatic stars — Edward Villella, Patricia McBride and Violette Verdy — who have no equivalent in the company today. Most impressive among the 10 dancers were the radiantly girlish Rachel Rutherford, who was in her element and projected the deepest feeling among the group, and Sara Mearns, who played the flirtatious odd girl out on her own terms. “Other Dances,” created in 1976 for Natalia Makarova and Mikhail Baryshnikov, has deservedly become a keeper, performed by many stellar successors. Mainly lyrical in mood, it’s inflected with middle-European folk-dance motifs, as if to remind us of where the composer came from. It’s not a romantic duet but something more remarkable — an illustration of the intimacy dancers forge with each other through the act of dancing. This time out, Damian Woetzel, who retires from the City Ballet this season, partnered Julie Kent, a senior American Ballet Theater ballerina. Woetzel brought all his gifts to the occasion: virtuosic technical command, astute, gracious partnering, keen intelligence and craggy good looks. Kent, all ethereal delicacy, melted in his arms. “The Concert” (1956) is that welcome rarity, a successful funny ballet. It depicts the reveries, from poetic to absurd, of the concert-hall audience. Sterling Hyltin, her waist-length wavy blond hair prominent, shone as the production’s ditzy siren, while the jokes about all-too-human types and choreographic discombobulation seemed new once again. Through June 29 at the New York State Theater, Lincoln Center, Broadway at 65th St. Information: +1-212-721-6500; http://www.nycballet.org.